Izvornik: 23rd Alzheimer's disease International Conference - Abstracts Book / Alzheimer's Disease International (ur.). - Caracas, Venezuela : ADI (Alzheimer's Disease International) , 2007. 56-56. Mjesto i datum: Caracas, Venezuela, 10-13.10.2007. Today when Alzheimer's disease (AD) is becoming health priority, and when we are expecting the epidemic in future decades, it is very important to detect, diagnose and treat patients in early stage of the disease. The Alzheimer Association (U.S.A.) has developed a checklist of common symptoms of the disease. 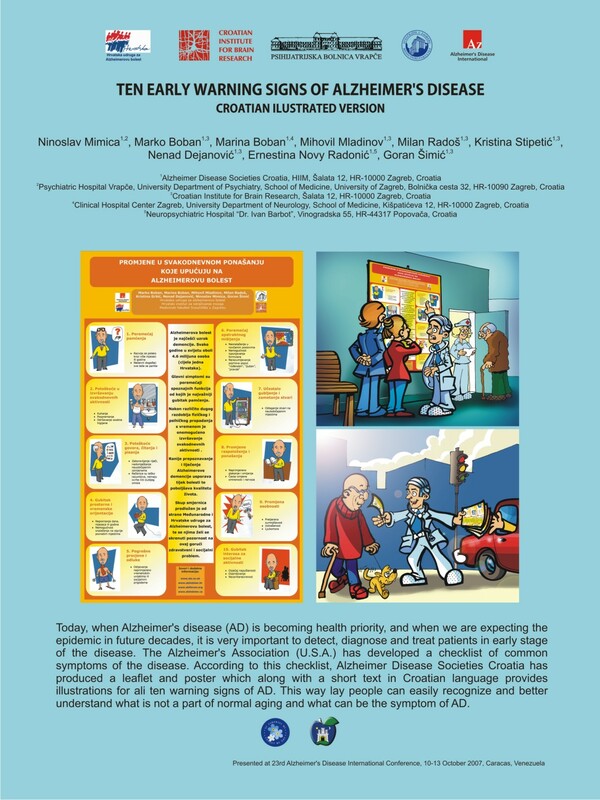 According to this checklist, Alzheimer Disease Societies Croatia has produced a leaflet and poster which, along with a short text in Croatian language, provide illustrations for all ten warning signs of AD. This way lay people can easily recognize and better understand what is part of normal aging and what can be the symptom of AD.